Achtung, Achtung, eine wichtige Durchsage der Geschäftsführung: Unsere Versandkosten sind im Sommerurlaub! Bis zum 21. Juli versenden wir alle Bestellungen ab 100 € versandkostenfrei! Attention, Attention, some important information from the management: Our shipping costs are on vacation! 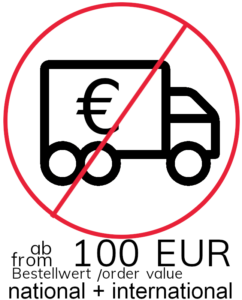 Until July 21st we ship all orders over 100 EUR without any shipping costs! Just put items with a total amount of at least 100 EUR in your shopping cart and there will be no additional shipping fees at the checkout. No matter where the package shall be send to. Just enjoy the summer (and it’s pride parade time).